Thank you for joining with RelyLocal to support a “Buy Local” campaign in Racine and Kenosha. As a new member of the RelyLocal family we have a checklist of suggestions to optimize your listing and promotion and have a meaningful impact on our community. __________ COMMENTS - Ask your customers to post a comment on your listing. This will build credibility and promote organic growth. __________ PHOTOS - Add up to 10 photos to your listing and update as needed. Just email images to nickchristensen@relylocal.com and we will post them for you. Show off your services or products. Let customers preview what you have to offer – friendly staff, superior craftsmanship, soothing spa décor…. __________ VIDEO - Add video clips. Send them to nickchristensen@relylocal.com to post for you. Tell customers what you do. Ask customers to give testimonials. __________ COUPONS - Use coupons and update them often. Customers are substantially more likely, up to 85%, to try a new business if a coupon is offered. __________ EVENTS – We have a new Community Events Calendar on RelyLocal. Post in-store events or parties you are having. __________ DIRECT MAIL – Think you can’t afford direct mail? NOW YOU CAN! Using the RelyLocal Direct Mail Advertising. Your Ad will be on a large 9 x 12 inch glossy postcard, each card features just 15 advertisers and every ad is in plain view on the jumbo two-sided card. The card is so big it can’t be missed. 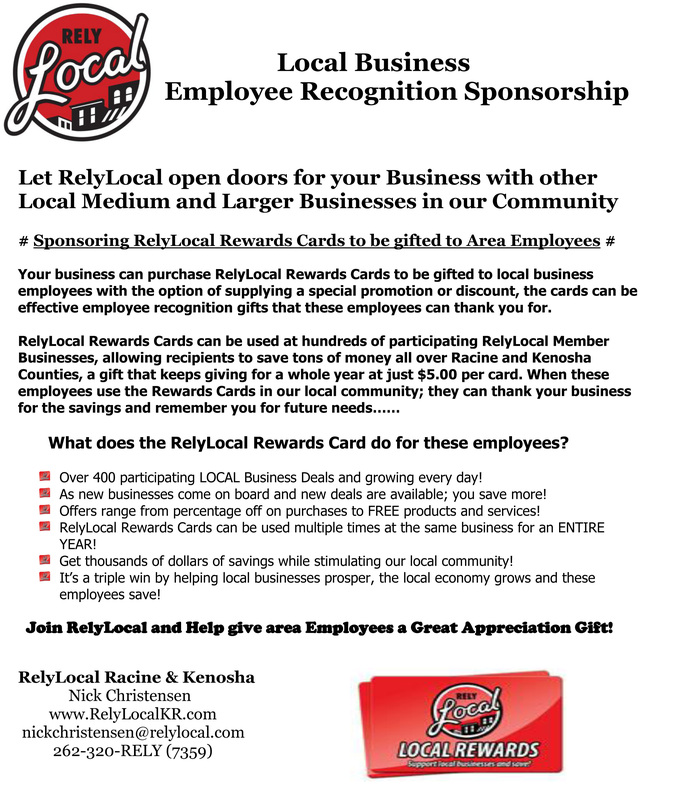 Only one business category is allowed on each card, get instant branded recognition with the RelyLocal-Racine & Kenosha name. __________ BOOTHS AT EVENTS – We setup tables at events such as a First Fridays, farmer’s market, Chili Cook-offs, Halloween Fairs, etc and we are promoting YOU. Please keep us up to date with your business cards, brochures or fliers. We don’t need hundreds of them, but at least a few to pass out to those who are interested. You can also join us in the booth and promote yourself! __________ FIRST FRIDAYS – Attend our free networking event on the first Friday of each month. Donate a small prize or sponsor food or beverage for some extra visibility. Bring literature/ cards/ brochures for the RelyLocal members-only table. __________ FACEBOOK / TWITTER – We spotlight 2-3 members each day on Facebook and Twitter. Follow us or like our page and retweet or repost what we share about you. Use our streams to promote yourself as well! This membership is as a tool like any other. The more you use it, the more powerful it becomes! All these benefits are included in your membership, so take advantage! We will add new benefits over time as well, so keep an eye out for our weekly email newsletter to members for updates!